Djerma horses are from Western Africa and the middle of the Niger. They originated from Barb and Dongola horses. The name Djerma comes from the tribes people of Djerma. 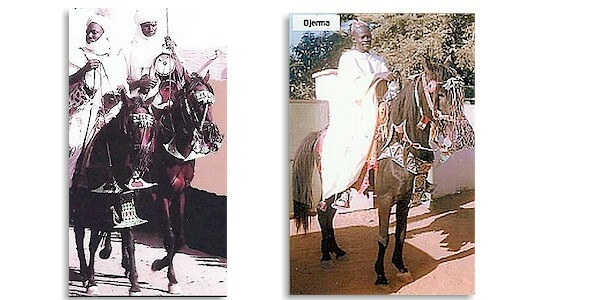 To own a Djerma horse, in Africa, is considered a sign of wealth. These horses are held in high esteem in Africa especially by the tribes people. Their owners adorn the animals with colorful fabrics, fringes, braids, etc. The riders adorn themselves, as well. These horses can be seen "decked out" in parades festooned with the royal colors of red, burgundy, purple and blue. They are dark colored -usually brown. Their build is light. Although they are small they are fine runners. Because they are smaller and have a good temperament, some are breeding the Djerma to be used by children and women and sold outside the country. There are mixed feelings about this in Africa as many feel that Djerma Horses should be kept within the country as a symbol of pride.